Up again very early in the morning and away on the plane from Santiago to Easter Island (or Rapa Nui or Isla de Pascua). We arrive in Easter Island near the middle of the day, pick up a rental car, drop off our things at the hotel and head off into town for a while. It is a fine warm day and we settle down for a while for lunch at a seafront café. We gaze out at the surf and the surfers, the bathers below us and the fishing boats on the other side of the small cove and already start to appreciate the languid pace of island life. Easter Island is roughly triangular, with three volcanic cones defining the corners of the triangle, so it isn’t very large and the furthest you can go in one direction is about 23km. Still, you have to watch out for horses and cattle on the roads, some of the roads can be a bit rough and maximum speed on the open road is 60kph, so it still takes a while to get around. Towards sunset, at the suggestion of a staff member from the tourist bureau, we headed for Anakenga half-way along on the South coast. It doesn’t seem to be the right place and light for us at this time so we keep going and end up near the far end of the Island, at Ahu Tongariki. The moai are the statues. All of the moai were felled by the islanders some hundreds of years ago; they have been reerected on a handful of sites only. The platform and surrounds they are standing on is called an ahu. This is the greatest number of moai on any restored ahu. 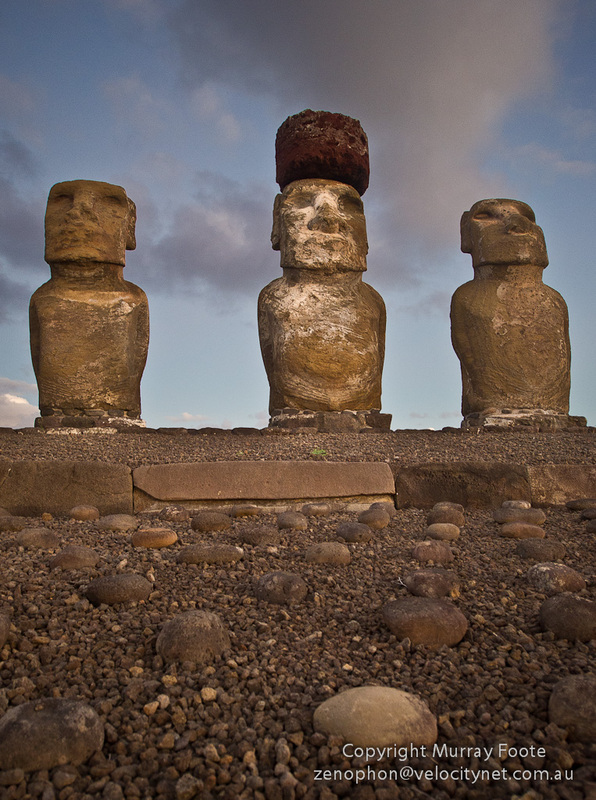 These are three of the moai from the ahu. You can see the rounded stones on the sloping section that leads up to the platform on which they stand. All of this is part of the ahu. One of the moai is wearing a pukao or topknot. The moai are all different, representations of individual ancestors. They are standing in the open air, exposed to the elements, and therefore fragile. 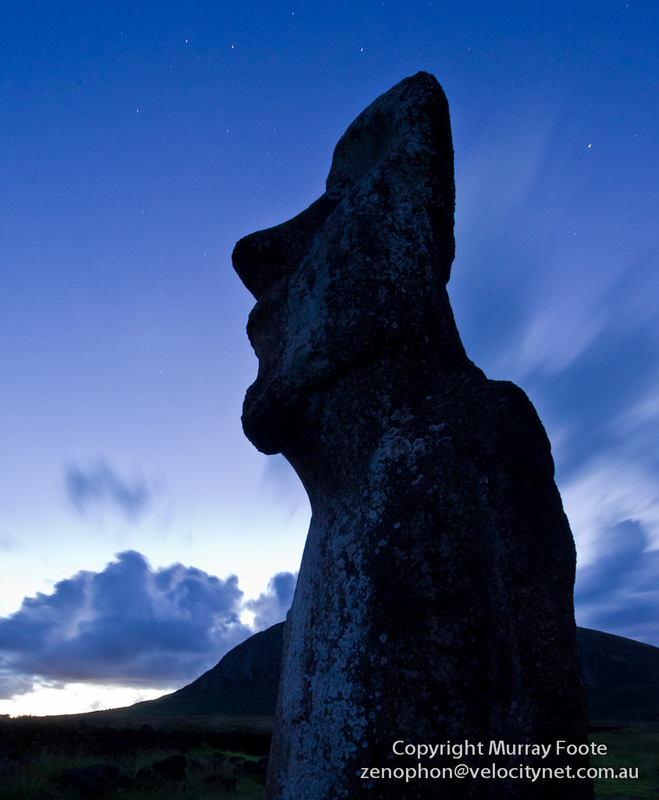 No-one may walk on an ahu or climb on a moai. Here is a wider view of Ahu Tongariki, which will give you a better idea of the scale. You may be able to make out my travelling companion Greg on the far left of the photo (you can always click on an image for a somewhat larger sized image). Ahus included a large flat area in front, used for ceremonial purposes, no doubt with many people. The large rocks in front are in fact pukao (topknots). They no doubt belong to individual moai but it may not have been practical to identify which belonged to which and to replace them on top. By now this is after dark. The 30 second exposure stretches out some of the clouds and you can see the stars. We are in Easter Island for eight days, including six full days. You have just seen images from one ahu with fifteen moai. OK, this is a particularly significant ahu but there are 360 or more ahu on the island and 900 moai. 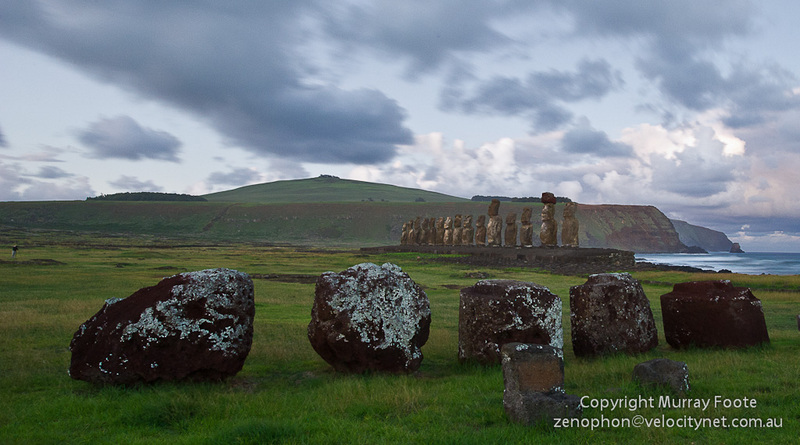 There are probably many more moai hidden under the ground because lots of sediment can deposit over hundreds of years. Easter Island is one huge archaeological site. 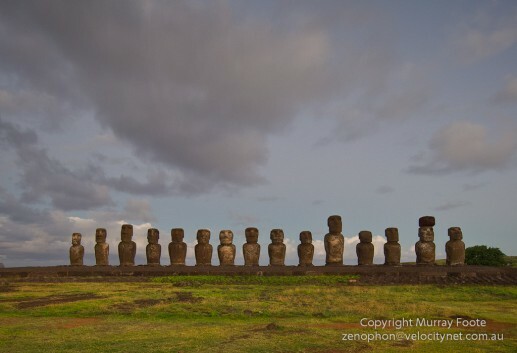 This entry was posted in 1st Page for Easter Island, Ahu Tongariki, Easter Island, Isla de Pascua, Rapa Nui and tagged Ahu, Ahu Tongariki, Archaeology, Easter Island, Isla de Pascua, Moai, Photography, Rapa Nui, Travel. Id love to go there, really great photos from your trip Murray! Hope you can see plenty of blues bands on your travels! It’s a great place to visit and it’s good to spend say 10 days there, there’s heaps to see. No Blues bands on Easter Island but when I have finished posting for Japan in two or three months I will probably post some images from my trip to New York last October and I saw a few Blues bands there. Thanks heaps, Lois. It’s wonderful to go to a place where there is so much history and so special and where the history is so much alive.